Pause for a moment and think how many times you have said “Stop Scratching!” today. I used to keep saying that to my baby girl Marcie until I read that it is not the best way to get her to stop scratching. There’s little research done in this area available online, but supposedly, asking your child to stop doing something is less effective than rewarding him/her for not doing it. Also, it can annoy/upset your child to be told consistently to stop doing something that they can’t control. My own guess is that they are smart enough to know that scratching gets our attention and even do it more when throwing tantrum. Read this A to Z compilation of distraction from scratching eczema tips. Of course, the eczema needs to be treated, do read my tips and Marcie’s doctor’s skincare tips. What is most important to me is to stop remarking to my hubby that it is his bad gene and also to banish the words “bad skin”. I noticed that my baby scratches even when alone, as scratching feels good, so I am also very careful not to imply she’s doing it on purpose. I have drawn a picture book (published as e-book, “A to Z Animals are not scratching!” to teach young children not to scratch and also starting a support group for moms (and dads) who need people to understand what we are going through (and hopefully, we can reduce the inadvertent “Stop Scratching!” to our children!). ATXmom, I took your advice and tried the Zipadee-Zip! I found out that I could cover up my little one in his skin meds and then suit him up in his swaddle transition blanket. This keeps his skin soothed, and prevents him from scratching himself. Thanks again for the tip! Thanks Carolina for sharing that it works for you 🙂 Was being too warm an issue with the swaddle transition blanket? Love to hear more about your son’s experience! Have a good week too, hugs! We use the Zipadee-zip too! Absolutely love it. It’s been so wonderful for helping with our LO not to scratch. Highly recommend it for anyone but especially for a LO with eczema. Thanks for sharing 🙂 Good to know that you’ve found something that works to keep the scratching off! I felt so much for my LO when nothing would relieve his scratching! I eventually bought him a Zipadee-Zip! Have you seen them? The sleeping suit insulates your child’s hands, and because its made of super soft material is does not allow him to scratch himself. My home remedy is to cover him ointment and then put him inside his Zippy! Nice Ashley! n thanks for dropping by! I haven’t seen the Zippy but sounds like a lovely garment that works! I’ve been using ointment on my daughter lately too – we’re summer all year round and we used to not use ointment cos it’s too sticky – but lately, we find it suitable for our preschooler who starts to complain every time we moisturize! Whatever works! Hello Mei, I just want to say that I feel can’t go on sometimes. My daughter just turn 3 few days ago. She has had eczema since she was 2 months old. It has been a terrible journey, I feel I have been through everything. The 1st year was the worse, she had her on her face, arms, pretty much everywhere except the diaper area. She got better with age little by little. Any case, she is 3 now and her skin is much better even though very dry. She suffers from multiple food allergies so as long as she does not eat the wrong thing we are ok. Her eczema is pretty much under control now with a 3-5 times a day moisturizing routine and and a very closely monitored diet. However, she is still SCRATCHING and it is driving me crazy!!! I completely understand what you mean when you say try to distract her and how you have to be with the child at all times. Yes I have to be with her at all time otherwise she starts scratching her legs and arms sometimes even her face. We do TV, movies, games, ipad, educational games, she has lots of toys, we have to take her out very often to keep her entertained. Alkl those things help but she still scratches. She has also developed a very temperamental personality and that is what scares me sometimes, She does not like to be told not to scratch, she gets very upset when I tell her. I feel like I am lost sometimes, I feel that I have finally been able to get her eczema under control but I still have a problem. She tries to scratch very badly specially when her skin is uncovered. I always need someone to help me when we give her a bath or even when changing her so we can prevent her from scratching. She gets upset when we hold her and when we don’t let her scratch. The scratching is definitely psychological in my case now, like I said her skin is clear and when she has good days of intense entertainment her skin even gets soft. Yes, I agree it is attention what she wants but I mean I cannot ignore it otherwise she will scratch util she gets to her bones, I don’t know what to do. I am writing to ask if you have any tips on how to keep your toddler happy while dealing with this condition and maybe other tips on ways to keep her busy and entertained. Maybe it will just take time, more time… Thank you. My 2 year old does better when I don’t give him dairy but he still scratches too. I have had success with trimming and filing his nails once a week and letting him put his own lotion on and teaching him to tap instead of scratch. I don’t believe it’s behavioral because my little guy tries to scratch behind my back & he doesn’t want me to catch him doing it. People don’t normally scratch themselves bloody while sleeping so it’s something internal deep in the tissues making them uncomfortable. I used to be like Mei and only trust peer reviewed literature but they say it’s incurable and want me to continually use harmful steroids on my child. I’m having way more success following all the advice of the blogging moms out there and many of them say that with a leaky gut that your child can begin to react to the new foods you give him/her even though you’re cutting out all the old ones you know they react to. So I’m trying to heal my son’s gut with GAPS diet in hopes that he outgrows his eczema sooner than later (some have it till well into their 20s)! Keep researching and don’t give up! I was slaving over my son’s elimination/GAPS diet for a while but all the extra work is worth it to have him sleep through the night and not be bloody and not have to bandage him all the time. I truly hope you figure out how to help your sweet child. Oh and GAPS believes that the behavioral/moody issues are related to the leaky gut syndrome too but I don’t follow the diet to a T because my son is so young and I don’t think eczema warrants a full 2 years on the diet either. It was created for severe leaky gut symptoms like autism. When you think your child is healed start introducing more foods to prevent the low carb GAPS diet issues, (some say they got adrenal issues from doing GAPS too long for their problem). I’m a believer in this because I’ve seen it help my son tremendously. He’s only been on it for a few months and I’m already bringing him off of it but will still do the broth, probiotics and limited grains in hopes that he can be fully healed so he can eat dairy again as I’m a country girl from the US and don’t know how to cook without butter! Prayers for you! I’m less concerned with diet cos my gal doesn’t have any allergy and none so far we noticed too. Her scratching seems to be part real itch and part behavioral – I used to think it’s all real itch but one day, she remarked to me that if you don’t do it, I will keep on scratching. So part of her scratching is related to frustration and whenever she doesn’t get her way. Maybe cos she’s 5, there’s more behavioral to it. Keep us updated and if there’s any other recommended mommy sites, feel free to share about them here too! Mei, I wanted to ask you how is your child in school? Like I said my daughter is 3 and I am afraid of sending her to school because I believe that she might be scratching without the teacher noticing (I would not be able to blame the teacher because I know she cannot keep on eye on my daughter at all times or be checking on her every 10-15 minutes – I am a teacher myself and I know that is not possible) I am just afraid that when she comes back from school her skin will be very damaged. Also, is she able to wear shorts and short sleeves shirts without a problem, was it ever a problem? My daughter tends to scartch more when her skin is exposed so I wanted to ask. Thanks. Hi there! I know what you mean! My girl goes to school since 1 year old. She does scratch in school and when she’s younger, sometimes she comes back with deep scratches and as she’s older and understands, teacher can control more easily. Still, obviously, impossible to expect no scratch. I do find that sometimes her skin is better after school, cos there’re friends and activities and she’s not scratching so much. I cover my gal too in long pants cos of scratching, but she wears shorts in school and does fine. My daughter goes to Columbia Academy, they have only 2 schools in Singapore, no franchise, excellent school! At JEast. John & Keyda, My son used to scratch patches of skin off too especially in his sleep and allergy testing didn’t reveal any food triggers. I put him on a combo of elimination diet & GAPS diet and discovered he can have goat milk but cow milk makes him bloody within days. Even cooking with butter makes him itchy and need areas bandaged. I used tea tree oil and cage put oil to prevent infections. Hope you find the true cause to end your child’s suffering too. Thanks Rachel for your sharing! Yes, it’s strange, isn’t it? Why many parents report their child’s eczema improved after removing certain foods yet allergy testing doesn’t show. I’m wondering if it’s a case of food intolerance that may also affect skin.. you think? Thanks for your insight and have a lovely week ahead! IgG is still a subject that seems to divide nutritionist and allergist. I see many nutritionist mentioning IgG and how it affects their clients but the allergist community and supporting literature is that IgG is high if you take more of some foods and not related to immune reaction. My wife and I have tried the reward method and it only works up until the reward is given. After we reward her, she will go and scratch her self raw. She has it from head to toe and it is very bad on her face. There are times when she has clear liquid running down her face, fingers, ears. It is killing my wife and I to keep up with it. My daughter doesn’t like lotion because they burn. I have tried pleading with her that if she stops it will get better and we can use the lotion. Every method is a fail. We almost feel that she needs to be in a tub with aloe vera and not get out until its all gone. We have tried just about every lotion, even for eczma, all the detergents for sensitive skin. Running out of ideas. The distracting doesn’t work because as soon as we are not looking, she scratches and peels layers of skin off. Sorry to hear of how hard it is for you now John. It’s true though that the intense itch can’t be easily distracted from, so the priority is to get the eczema under control. The raw skin is a risk to secondary infection..quite easy to get other bacteria, fungus/yeast, viral infection. Wondering if you’re seeing pediatric derm? allergy testing, wet wrap, depending on the age – dust mite more likely for older kids, bedding washed in 60degC water… all tried? My child bites and peels fingers, but her eczema is well-controlled. Hope yours get better soon! I know the eyelid is a difficult place! I clean my child’s with lukewarm cotton pad and moisturize a little if really dry. Sometimes I bring her swimming, just to kill staph bacteria and have a fun cooling time. Other times, we entice with reward stickers and whatever tricks, carrots and sticks we can think of. I love your blogg, it’s been very useful, thanks for sharing your experiences. We’re currently going through a hand, foot and mouth outbreak with antibiotics and a severe rash in my 17 month old. Your information and experience was a comfort. A few months ago I attended an eczema workshop for parents. The nurse running it told me to gently take his hand and teach him to tap the itchy area he was trying to scratch. 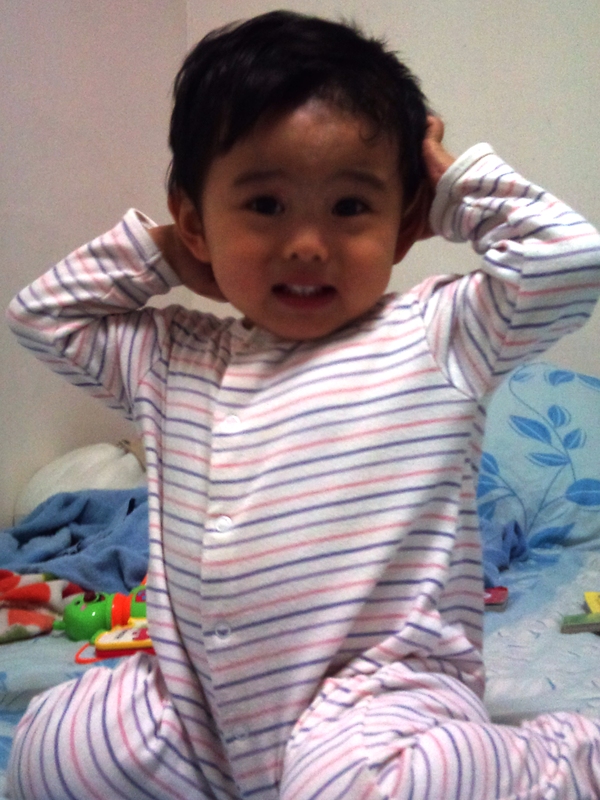 Lately he has started tapping his arms, it’s not so easy in the neck creases, but it beats scratching! Thanks Catherine for dropping by! And yes, tapping beats scratching! And your 17 month old is doing great for changing to tapping, mine is 4+ and still don’t quite tap. Sometimes she replaces with finger biting, which is worse cos she’s been having infection from mouth bacteria at her fingers! Hope the eczema improves for your son, take care! Yes, Mei. You may think I am careless. I focus a lot on washing dishes and settling down things in the kitchen where we recently moved in. I want to ask suggestion from you. Her right cheek has very thin skin after flare-up. For the first time flare up, the skin broke and it is the very first and frequent site for following flare ups. What do you recommend to do? I used to say “STOP IT” but never works. She always scratch her cheek when I leave her alone for house works. Agree with you, now she understands she gets attention from scratching. Last weekend, I cleaned my kitchen. I have done my job (hooray!!). Her cheek was bleeding badly when I returned to her. (It made my heart broken). I promised (but not for the first or last time) it won’t happen again. Now, I started searching (before deciding cost effectiveness) learning materials to distract her. TV? or lots of craft to do? I always have to check on her every 10 mins or so, just to make sure she’s not scratching, or peeling, or too close to TV! Ended up buying lots of activity books! I was told by NC nurse Lim from KK to put the moisturizer / Calendula cream in the fridge, when my boy scratch, or during hot days, I applied the cream straight from the fridge, it cools him down and stops the itch. Hope it helps. I know! Until now I still can’t stop saying stop scratching, especially when my husband is busy (physically or deep in thoughts!) and I want to get my housework done.. and there Marcie is scratching and we can’t let her keep scratching. Thankfully, she doesn’t scratch as hard though when we neglect to actively distract her, there’s still patches of red scratch marks, usually along the diaper line. I’m guilty of telling my toddler to stop scratching. Sometimes I think it’s just a habit of his now, so asking him to stop will make him realize he’s doing it. But maybe that’s silly. We tried the reward chart and it didn’t work for us. But, we used the distraction techniques and of course when he’s really itchy we cannot let him sleep without the ScratchMeNots or Kumfy Cotton clothing to cover his hands. There were many times he’d have to cover his hands during the day too, but thankfully those days have passed.